Here's a link to many of the character news items for the heros and villians of the second episode of Star Wars. They're updated automatically as news happens, and we're out hunting down the best and most reliable news and information we can get. Enjoy! NOTE!! - The first half of this listing contains names that Lucasfilm has publicly acknowledged and characters known to appear in Episode II. There are a few possibly, very minor spoilers in some of the text items, so be careful. There are big spoilers on down in the second half of the page. This listing was assembled with the help of Sith Interceptor, Tiernan, and Hoedaack from the Jedi Council Forum. A blue Twi'lek and Jedi Padawan, seen in the Dark Horse comics. Ahmed Best (Jar Jar) plays a patron at a nightclub. Jedi Council member Adi Gallia returns for action in Episode II. Anakin is now 19 and is still the Padawan of Obi-Wan Kenobi. In Episode II he is assigned to protect Padme from potential assasinations and accompanies her across the galaxy. Previously seen in the classic trilogy (like Walarus Man), this race makes an appearance in Episode II as well. A loyal Republic senator. Masked, radio controlled character. Lucasfilm stated we'd see Aurra Sing in Episode II, but we still await confirmation. A Female Twi'lek seen in the Coruscant nightclub. Bail Organa, Princess Leia's adopted father, will make a brief appearance in Episode II with more screen time in Episode III. Another Jedi in Episode II, Padawan of Luminari Unduli. Beru Whitesun eventually marries Owen Lars and becomes Luke's aunt in A New Hope. We see the younger version of her in this film. She and Owen are possibly boyfriend/girlfriend in the story. We discover that Boba Fett is actually a clone of Jango Fett - the first of many. This 12-yr old boy eventually becomes the bounty hunter and Sarlaac food we love from the classic trilogy, but he already displays his fighting spirit in Episode II. He is a gift from Count Dooku to Jango Fett. A Female Jedi that fights in the arena. We catch up with C-3PO again on Tatooine, still owned by Shmi. C-3PO finally gets a new exterior, but it is battered and dirty. Still a ways to go before the golden version! This warrior is from another batch of clones we meet in Episode II. They are possibly one of the good guys. Typho replaces Captain Panaka as Padme's bodyguard in Episode II. Cliegg Lars marries Shmi and becomes Anakin's new stepfather in Episode II. He is a business man on Tatooine. Why fight on the front lines when you can have a clone do it for you? Clone Troopers make up the Republic fighting force for the Clone Wars (and eventually the stormtroopers). Each fully trained clone soldier represents a considerable investment. Injured or isolated men are retrieved whenever possible. A clone trooper's full combat armour is the basis of an integrated system in which the gunships are vital links. Individual troopers can receive command signals and relay status signals via this system. Troops also share tactical video from their helmet visors, with multi-spectral imaging that penetrates smoke, fog, and the airborne soil of the most explosive battle zones. The airtight and thermally regulated body glove is impervious to germ and chemical agents, and provides protection in space and hostile atmospheres. The armor's heat resistance allows troopers to stride through the searing interfaces of theatre shields like lifeless Battle Droids, as well as deflecting glancing blaster shots and damping direct hits enough to improve survival. The full armor worn by vehicle crews restricts movement (uniform suppliers were given no time before the Battle of Genosis to design modifications that reduced covering on limbs and torso). We see clone children being trained in the art of war on Kamino. Young Boba Fett is part of the lot. This is a new faction in Episode II like the Trade Federation and is a member of the Corporate Alliance. A handmaiden and bodyguard for Padme as she faces assasination on Coruscant. The Corporate Alliance is made up of a group of corporations that have made a political and business alliance. It includes the Trade Federation, the Commerce Guild, and more. Count Dooku is a "charismatic separatist". He is one of a group of Jedi known as the "Lost Twenty" who left the order in search of other pursuits. He is in league with Sidious and holds the leash of Jango Fett. 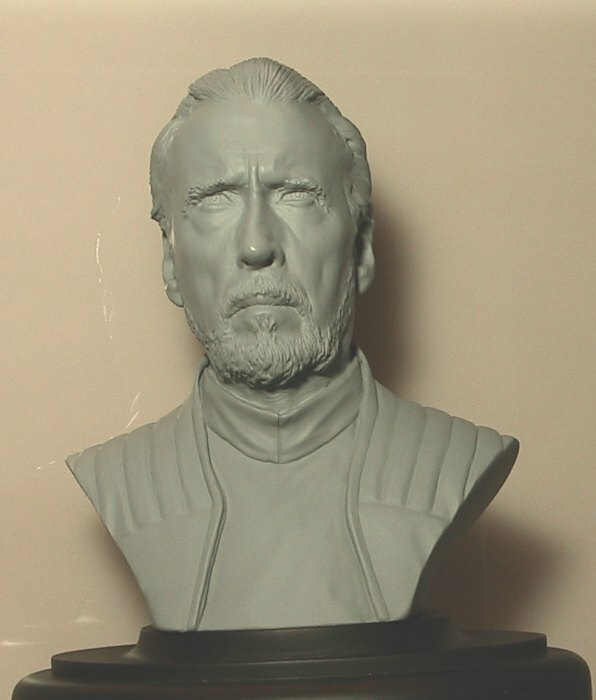 See Count Dooku for more details. See also Supreme Chancellor Palpatine. Jedi Council member Depa Billiba returns for action in Episode II. Dexter owns a diner on Coruscant named "Dex's Diner". Some of the action and intrigue happens there. A handmaiden and bodyguard for Padme. The Dugs, like Sebulba, make an appearance in Episode II. Expect to see more of Eeth Koth, Jedi Council Member, in Episode II. Elan is a drug dealer on Coruscant who offers "death sticks" to Obi-Wan and Anakin. Expect to see more of Even Piell, Jedi Council Member, in Episode II. Aide to Senator Zo Howler of the Anx species. Geonasians are an alien species native to the planet Geonosis, a rocky world, and home of Poggle. Geonasians come in several forms including flyers that have wings, picadors, guards, workers, and more. They resemble battledroids in form and are likely the manufacturers of them. Head waitress at the diner. One of the financial forces in Episode II. Previously seen in ROTJ and Episode I, this race makes an appearance in Episode II as well. A Loyal Coruscant Senator. He hails from the planet Semeria. The original warrior that the clones in Episode II are made from. Wearing a blue and silver version of Boba Fett's Mandalorian armor, Jango Fett is more than a match for Obi-Wan, Mace Windu, or any other Jedi that may cross his path. He works for Count Dooku in this film. Jar Jar makes another appearance in Episode II, this time helping to represent the Gungans for Naboo in the Senate. The Jawas again make an appearance in Episode II. Padme takes Anakin to her homeland on Naboo to meet her family. The new alien race from the planet Kamino. They are expert Cloners. This Coneheaded Jedi Council member will have significantly more screen time, and action, then he did in Episode I. Prime Minister Lama Su is one of the rulers of a new planet in Episode II - Kamino. Anthony Daniels plays a patron at a nightclub. Another Jedi in Episode II, master of Padawan Barriss Offee. Head of the Jedi Council, Mace Windu will have a spectacular lightsaber battle against a deadly foe. Madame Jocasta Nu helps Anakin with some research in Episode II. 5 year old Jedi and part of Yoda's "Bear Clan" training group. Seen briefly as a background character in Episode I, Mas Amedda will be seen more in Episode II. A loyal Quarren Coruscant senatorial aide to Tundra Dowmeia. Nute returns for more evil doings in Episode II, courtesy of the Trade Federation. Why are these guys still in business? Is now a separatist allied with the Confederacy of Independent Systems. Jedi Master for Anakin, Obi-Wan is older, wiser, and hairier than he was in Episode I. Obi-Wan splits up from Anakin to pursue an investigation for the Jedi Council. It doesn't take long for him to get in over his head. A Loyal Rodian Coruscant Senator. Expect to see more of Oppo Rancisis, Jedi Council Member, in Episode II. This senator was seen briefly in Episode I. He will play a larger role in Episode II. We meet the younger version of Uncle Owen in this film and discover his new family ties to Anakin. Several young jedi are seen training in Episode II. No longer Queen of Naboo, Padme now represents her people as a Senator on Coruscant. The problem is someone wants her dead. As she travels around the galaxy with Anakin, we learn more about her family and background when she takes him home to Naboo. Still sticking to his evil ways, Palpatine manipulates the Senate to do his bidding and start the Clone Wars. A blue female Twi'lek and assistant to Senator Orn Free Taa. One of the separatist senators and Magistrate of the Corporate Alliance. The Jedi Council member will be focused on in Episode II. Plo Koon is involved with a mission with Ki Adi Mundi. Poggle is a Geonosian who heads up business dealings with Count Dooku and Neimodians from the Trade Federation. Official title is "Archduke". Since the people of Naboo elect their Queen, Padme moves on to a role as senator and Jamilla takes over as ruler of the planet. The ever-reliable R2-D2 follows Padme and Anakin in their adventures to Naboo, Tatooine, and beyond. The blue Republic Guards seen in Episode I have now changed to the red guards (Royal Guards) we saw in ROTJ. Previously seen in the classic trilogy (like Greedo), this race makes an appearance in Episode II as well. The Jedi Council member will be involved in Episode II. A Jedi warrior in the Geonosis arena, member of the Jedi Council. One of the new Jedi in Episode II and a new member of the Jedi Council. Now married, she has a new life on Tatooine as a free woman. But what will happen when she and Anakin meet again? One of the separatist senators and part of the Confederacy. She's also president of the Commerce Guild. Sio Bibble, another Episode I character, returns for Episode II. Senatorial aide to Palpatine seen in his office. A green female Twi'lek and assistant to Senator Orn Free Taa. Actor: Rena Owen Lama Su's Kaminoan assistant. The Techno Union is an organization that oversees the production of technology and is a political force. Seen in Episode I. One of the separatist senators and part of the Confederacy. A loyal Quarren Coruscant senator. The Sand People again make an appearance in Episode II and play a very important role in the life of Anakin Skywalker. The Twi'leks again make an appearance in Episode II. One of the separatist senators and part of the Confederacy. Foreman of the Techno Union. Watto returns for a brief cameo, and encounter with Anakin, on Tatooine. Previously seen in the ROTJ, this race makes an appearance in Episode II as well. The Wookiees again make an appearance in Episode II. Expect to see Yoda in some serious action in Episode II. We will see why he's the Master. A female bounty hunter sent to kill Padme. A loyal Quarren Coruscant senator aide to Tundra Dowmeia. One of the new Senators of the Anx species. From this point on there are nothing but spoilers. Don't scroll down unless you want to see potential spoilers for Episode II! A fully CGI Jedi who fights in the arena battle. A CGI alien senator from Glee Anselm. A Kaminoan alien seen in Dex's Diner. New alien customer at Dexter's diner , fully CGI. A Rodian (like Greedo) seen in Dex's Diner on Coruscant. Previously seen in ANH, ROTJ, and Episode I, this alien species will make a reappearance in Episode II. A young Jedi member of Yoda's Bear Clan group. A friend of Padme and the Naberrie family. A customer at Dexter's Diner. Ko Sai is the chief scientific Officer on Kamino. She oversees the clones production. One of the new Senators from Uyter and a corrupt one at that. One of the servants in the Naberrie family household. Paddy Accu is the ferryman who takes Anakin and Padme to the Lake Retreat. They travel there in the Gondola / Water Speeder. Paddy Accu is also the ground keeper at the Retreat. PK-4 - Analysis Droid Works in the Jedi Temple. Actor: Liam Neeson May return in a hologram. A Dug (like Sebulba), particularly repulsive and mean, seen in Dex's Diner on Coruscant. Not much is known yet. One of the separatist and part of the Confederacy. Chairman of the Intergalactic Bank Clan. A Dug (like Sebulba) seen in Dex's Diner on Coruscant. An alien of the Nikto species seen in Dexter's Diner. A Rodian customer at Dexter's diner. Possibly Darth Sidious pretending to be one of the good guys. A Jedi warrior in the arena. One of the separatist senators and part of the Confederacy. A Geonosian assistant of Poggle the Lesser. A servant for Padme's mother. Named after the everlasting Hostess dessert and aide to Senator Passel Argente.